Truly compelling music makes the personal universal. 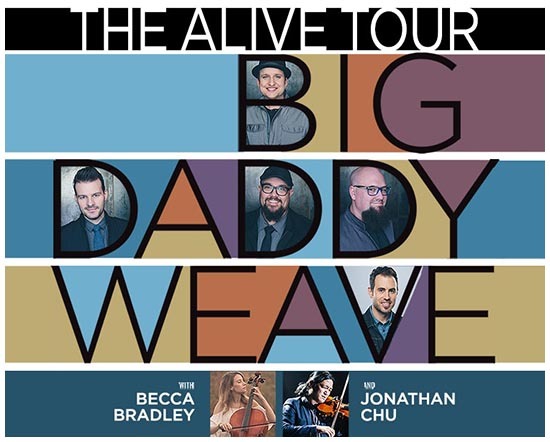 Few artists have done that more consistently or more movingly than Big Daddy Weave. Through more than a decade of hits like "In Christ," "Audience of One," "You're Worthy Of My Praise," "Every Time I Breathe," What Life Would Be Like," and "You Found Me," they have shared the journey in a way that has won the ongoing respect of fans, press and industry alike. Their musical journey began with a Dove Awards nomination as New Artist of the Year in 2002 and includes a 2010 Dove Award for the album Christ Has Come. They have been honored at ASCAP's Christian Music Awards, were chosen for the WOW Hits compilations in five of the last six years and are one of the 10 most played artists at Christian radio over the past decade. Premium ticket includes the best seats for the concert, a post-concert photo opportunity with Big Daddy Weave, and a premium laminate pass. General Information: All ticket prices subject to $5 increase when purchased at the door. Children 3 & under are free if they will be sitting in a lap. Purchases are non-refundable.